Fear is a huge four letter word. Anyone going through a medical crisis experiences fear. It fills our minds when we get that first hint that something is wrong. We fear pain, death, and change. 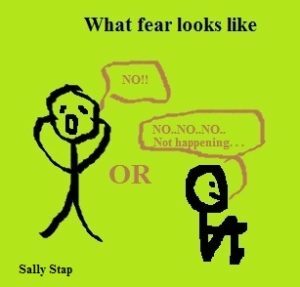 Fear triggers our autonomic nervous system – what controls our bodies below the level of consciousness. This effects our heart rate, breathing, digestion and even perspiration. Autonomic functions are involuntary but work with voluntary control in the somatic nervous system. Wow. That sounded technical. What it means is that we are not fully in control of our reactions. So when we feel scared, it’s ok. For some that means dry humor. For others it means prayer and meditation. For some it means curling up in a ball and for others it’s loud and screaming. As much as we appreciate the support of the people in our lives, only we will experience what we live and feel. Fear is something that Acoustic Neuroma survivors know the meaning and feel of. I sure felt it. At first it was rather abstract and distant. I knew something was going on in my head and my mind raced between “it will be nothing” and “I’m going to die.” That is a very wide range and felt dizzying. Each step of seeking answers to my symptoms required me to expose more data to my family. There was a point when I said for the first time out loud that I might have a brain tumor. I felt almost silly for worrying the people in my life but could no longer keep it contained in my imagination. When I was told “You have a brain tumor”, fear took over my body such that I spent all my energy trying to control myself. I tried to not shake, or cry, or stammer, but it happened. I wanted to speak but words would not come. My mind raced with questions but my mouth quivered. Everyone is different, but we all fight that balance of voluntary and involuntary when we hear the word officially. Telling my family and friends felt surreal, as did all planning for treatment. Fear ranged from controlled worry and fascination to the desire to escape my body. Sitting on a gurney in a hospital gown brought restlessness. I prayed even as I looked around the surgery prep room and watched other patients being rolled to their destinies. I wanted to be unconscious. As each medical professional did their part to prep me, surgery and its outcome was creeping nearer and slower. Having my doctor’s initials scribbled behind my ear raised the hair on the back my head. Entering the operating room was cold and noisy. I heard metal on metal as the instruments were prepared. I felt peace. It was time. I put myself in God’s hands and went to sleep, fear put aside for the moment. Waking up brought new fear. The inability to escape pain brought fear that I had no energy to acknowledge. Each unpredictable step of recovery giving no definitive answers to the future was terrifying. Only when I learned to accept that I’m living “only in the moment that I’m in” was I able to gain the gift of living and not fearing. This entry was posted in Lessons Learned and tagged acoustic neuroma, acoustic neuroma experience, brain surgery, brain tumor, sally stap, smiling again, surgery recovery on July 26, 2014 by sallystap. I at first was in shock. Then asked what is this? what does this mean? what are ALL of my options not limiting myself? How can I fix this? What have I been doing that may have caused this? March 27, 2013 I was diagnosed in shock and very upset. Now 14 months later june 1 2013 went raw and vegan. Going to California to get on Marijuana Oil to heal the rest of this and avoid the consequences of toxic radiation, and invasive surgery as I hear one is never the same once cut into. I will work with all options before choosing to treat the symptom only as it wont solve the challenge. It is slow growing and not deadly. In the 14 months mine has not grown 1 MM not one. I changed my thoughts never ever stress and changed completely my eating habits. Meditate and visualize as well as hang out with others who love and support me. We are one our bodies are tough I know they can heal. Dr Caroline Myss is amazing. She works with a brain surgeon on healing the mind and spirit. Also many firsts this year, earthing, sungazing up to 10 minutes not recommended unless you read about it, I love it, Painting, concerts with ear plugs not loud concerts either. To make myself happy I listen to music I love always. Makes me wonder what my Dad experienced when he found out about his tumor. Thanks for sharing this.